The Portable Document Format is currently the most popular file format on the Internet, accounting for over 1 billion search results on Google. Since its birth in 1993, the PDF has been a staple in everyone’s work and has become even bigger since the birth of the concept of paperless office. There are several main ways in which we utilize the PDF and one of the most significant is to view, share and store spreadsheet reports. However, there are some occasions when viewing and sharing is not enough – we need to extract certain tables or table layouts into editable Excel files, for further editing. The way we would usually perform this task is by manually rewriting tables from PDF into Excel, which is, undoubtedly, a good path to making mistakes. This method takes a lot of time and is very exhausting in the long run, especially when you are dealing with larger PDF spreadsheets, or the ones with complicated formatting. And since this is 2016, we would always rely on plan B. Unlike the real life, plan B on the Web is always a viable option. For this task, an alternative solution would be to resort to an online tool which will effectively translate the entire PDF document into an XLS file, leaving you with a fully editable spreadsheet at your fingertips. One of the tools that can do exactly this is Investintech’s free PDF to Excel online converter. 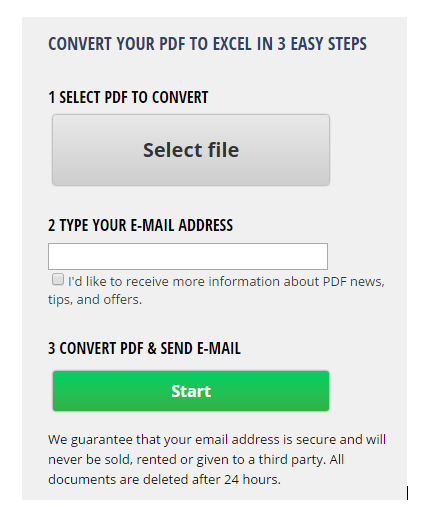 This brand new tool offers an excellent PDF conversion technology, backed by a company that’s been leading the PDF solutions market for over 15 years. This PDF to Excel tool is the latest in range of their online tools, specifically designed to provide a helping hand when the tough gets going and you need a quick web tool. The tool itself is intuitive and very simple to use. All it takes is just three clicks and you will shortly receive your converted file in XLS format. There are no limitations on the file size and all files are deleted after 24 hours, with user privacy being one of the biggest concerns for the developers. All in all, what we have here is not a tool that’s going to change your life. It’s not a tool that will leave you speechless and make you reach out to your friends to share the good news. This is a tool that will only automate one particular task for free and save you from wasting your precious time. And if that’s not worth the bookmark, nothing is.